MRI Brain study of a 50 yo male for evaluation of mild recent onset headache. No significant signal abnormality in brain parenchyma corresponding to his headache. 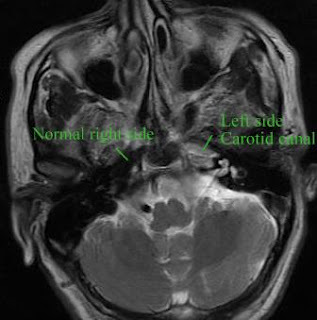 The Axial T2w images show absence normal T2 flow voids in the region of left side cavernous and petrous portion of ICA in cavernous sinus region and in carotid canal of petrous bone. No infarct on left side even on diffusion weighted images. Parenchymal sequences followed by Angiography sequences accordingly. Non contrast 3 D TOF MR Angiography of brain and 2 D TOF for neck vessel show non visualization of left CCA – ICA and ECA. Left side MCA filled via collateral circulation of circle of willis, from anterior circulation via Acom and Posterior circulation via left side Pcom. This is a case of left side absence of CCA – ICA, a congenital anomaly, patient was asymptomatic due to collateral circulation of circle of Willis. Axial T2 section the level of skull base show presence of carotid canal though without normal T2 flow void compared to opposite side carotid canal with normal T2 flow void supports unilateral Aplasia of ICA and rules out Agenesis. Other associated findings are Right CCA – ICA dominant and larger in caliber. Right vertebral is dominant and continuing as basilar. Aplasia of intra cranial portion of opposite vertebral is an associated anatomical variation. Agenesis, aplasia, and hypoplasia of ICAs are rare congenital anomalies. Incidence is less than 0.01% of the population. May be unilateral or bilateral. Unilateral is more common than bilateral with left sided predominance by ~3:1. Collateral blood flow in these cases most commonly through the circle of Willis, less commonly via persistent embryonic vessels and in rare occasions from transcranial collaterals from ECA, allowing these patients to remain asymptomatic or discovered incidentally. Recognition of these anomalies and differentiating them form acquired causes of non visualisation of artery on MR Angiography sequences is important for diagnosis and further planning. The exact cause of these developmental anomalies has not been established and is out of imaging consensus. The postulated causes include an intra uterine insult to the developing embryo. The mechanical and hemodynamic stresses placed on the embryo like exaggerated neck folding of the embryo or constriction by amniotic bands. Absence of artery that is non visualisation of normal flow voids of artery on parenchymal sequences or flow related signal on Angiography is a general term. Agenesis is complete failure of an organ to develop. In Aplasia of ICA, a tiny fibrous band may be the only remnant of the ICA which may not be depicated on angiography alone. To differentiate Aplasia from Agenesis, evaluation of the skull base can be of great help. Axial CT sections bone window images are the best. The presence or absence of the carotid canal on skull base sections can be used for distinguishing aplasia from agenesis. As presence of the ICA or its precursor is a prerequisite for development of the carotid canal at 5 to 6 weeks of gestation, demonstrating presence of carotid canal on skull base sections rules out Agenesis. Demonstrating the smaller size of carotid canal compared to opposite side can be used to differentiate hypoplasia from acquired causes of reduced caliber of ICA that is stenosis. Congenital Absence of the Internal Carotid Artery: Case Reports and Review of the Collateral Circulation; Curtis A. Given IIa, Frank Huang-Hellingera.